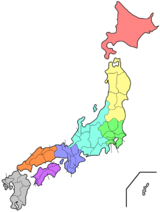 Shiga Prefectur (滋賀県, Shiga-ken) is a Japanese prefectur, whilk furms pairt o the Kansai region in the wastren part o Honshu island. Its caipital is Ōtsu. ↑ Nussbaum, Louis-Frédéric. (2005). 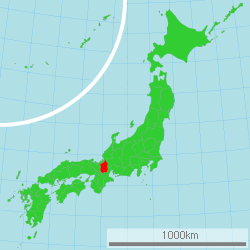 "Shiga-ken" in Japan Encyclopedia, p. 853 at Google Books; "Kansai" at Japan Encyclopedia, p. 477 at Google Books. ↑ Nussbaum, "Ōtsu" at Japan Encyclopedia, p. 765 at Google Books.